Ionian Rib cruising was created with the sole objective to ensure a unique tour around the Ionian Islands and to share with you our love for adventure and maritime leisure. Βeing yourself an enthusiast for excursions, we invite you to unveil the experience of discovering majestic beaches, swimming in the crystal clear water, traveling in the company of dolphins, and treating yourself to exceptional cuisine, coffee, or beverage at one of the seaside picturesque villages. In a top of the line inflatable vessel from Ionian Rib,have the opportunity to enjoy a private cruise and feel the immediacy of nature by taking in the sensation of flying over the water. Traveling with the inflatable vessel from our company in combination with the exceptional facilities and services, provides a once in a lifetime experience. Ski equipment, fruit and wine are just a few services that are offered. On our website you will discover destinations and activities that will enchant you. Let your dreams begin! 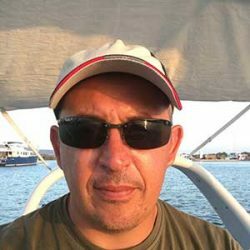 THEMIS SIFALAKIS I am originally from Hania, Crete but born and raised in Athens. I have been working as a plumber since 1997 and in 2005 I created Hydrotec, a company that constructs thermal and solar systems using renewable sources and heat pumps in houses. The big change in my life happened in 2008 when my wife and I moved to Lefkada. The contact with the sea was inevitable and in 2009 i gained my first boat and started tours to the islands fishing and snorkeling. With my friends urging me to take them on trips around the island I decided to create Ionian Rib Cruising in 2016. When I bought my 8,5m boat I started doing private tours giving guests the possibility to get a true taste of the Ionian Sea with great service. It was so popular that we added 3 more boats to our company in 2017 giving us the possibility to rent with a license. My colleges and I are at your service to make your holidays unforgettable.